MADISON BIKE BLOG: Do Wisconsin Drivers Have to Yield to Bicyclists in Crosswalks? Do Wisconsin Drivers Have to Yield to Bicyclists in Crosswalks? 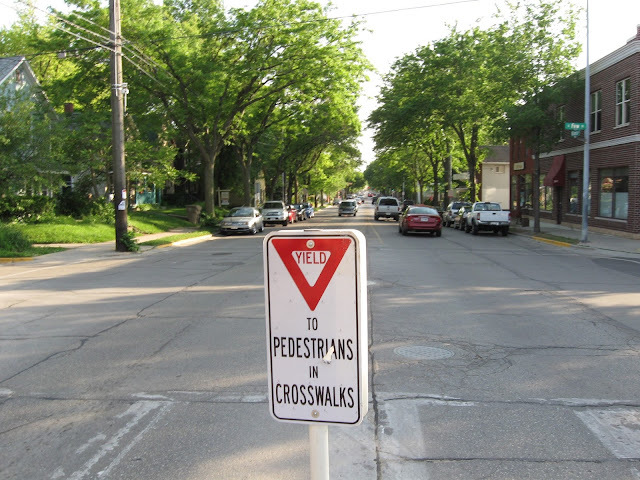 Drives must yield to bicyclists entering or inside crosswalks in Wisconsin under most circumstances. Many drivers think crosswalks are for pedestrians only and don't apply to bicyclists. This is 100% incorrect. 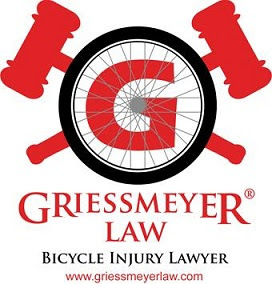 Note, even if a sign does not include the words "bicyclists" the Wisconsin State Statute does include "bicyclists." See below. Wisconsin law requires drivers to yield to pedestrians (walkers, joggers, people with babies in strollers, people walking their dogs etc.) and bicyclists. If a driver hits someone inside a marked crosswalk it is likely the driver did not see the person or the driver would have stopped for them. If the driver did not see the person, the driver will likely say the person darted out. Common sense tells us that people don't launch themselves in front of an oncoming 3000lb plus vehicle unless 1. they want to commit suicide or 2. they are a child chasing a ball into the road. The best way to avoid hitting people when driving is to drive at a slow and reasonable speed especially when approaching a crosswalk. Slow and reasonable in areas where people are known to cross roads is 20 mph or less because that speed allows the driver to stop in time to avoid injuring or killing a person entering a road. As seen in this police sting video from Milwaukee, Wisconsin, Wisconsin drivers often blatantly violate the crosswalk laws and when driving act as though pedestrians and bicyclists should yield to them. (1) At an intersection or crosswalk where traffic is controlled by traffic control signals or by a traffic officer, the operator of a vehicle shall yield the right-of-way to a pedestrian, or to a person who is riding a bicycle or electric personal assistive mobility device in a manner which is consistent with the safe use of the crosswalk by pedestrians, who has started to cross the highway on a green signal or a pedestrian signal authorizing crossing and in all other cases pedestrians, bicyclists, and riders of electric personal assistive mobility devices shall yield the right-of-way to vehicles lawfully proceeding directly ahead on a green signal. No operator of a vehicle proceeding ahead on a green signal may begin a turn at a controlled intersection or crosswalk when a pedestrian, bicyclist, or rider of an electric personal assistive mobility device crossing in the crosswalk on a green signal or a pedestrian signal authorizing crossing would be endangered or interfered with in any way. The rules stated in this subsection are modified at intersections or crosswalks on divided highways or highways provided with safety zones in the manner and to the extent stated in sub. (2).